As Australia faces record breaking heat, increasing fires and floods, and up to one million dead fish in the Murray-Darling basin, the need for serious emission reductions is undeniable. Replacing aging coal-fired power stations with renewable energy, and a just transition for workers in fossil fuel industries, is an urgent task. Yet Scott Morrison continues to do the bidding of the climate deniers in the Coalition. His shortlist of energy projects the government is prepared to underwrite includes a coal power station at Vales Point in NSW. And he has agreed to spend $10 million examining whether the decommissioned coal plant at Collinsvale in north Queensland can be reopened. The Labor Party wants to increase Australia’s overall reduction target to 45 per cent by 2030. This may not be enough to do Australia’s share in keeping warming to 2 degrees, let alone the 1.5 degrees that the Intergovernmental Panel on Climate Change (IPCC) says is the safe limit. Reducing emissions from power generation is the easiest way to cut carbon pollution. Around 16 per cent of Australia’s electricity came from renewables in 2016-17. The amount has been increasing rapidly. 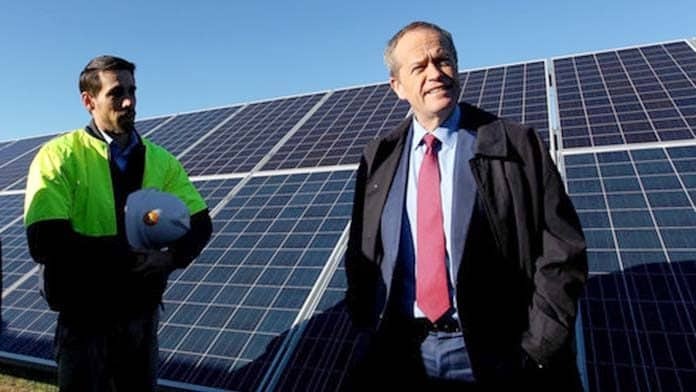 Labor has promised 50 per cent renewable energy by 2030. This is far from ambitious. A report last year from the Australian Energy Market Operator (AEMO), responsible for administering the National Electricity Market, showed that renewable energy would reach almost 50 per cent by then without any climate policy at all. This is because three large coal power plants must be replaced by 2030 anyway—and the cheapest replacement is now renewable energy. Currently, there are 22 coal-fired power stations in Australia. To meet the IPCC’s recommended targets, 12 would need to close before 2030, according to research from the Parliamentary Library in Canberra. Labor’s target guarantees the closure of only three. There needs to be a plan for the forced retirement of all existing coal and gas power plants. A target of 100 per cent renewable energy by 2030 is both necessary and achievable, but will require planning and direct government investment. When building new power plants, solar and wind power projects are now the cheapest option. But the existing coal power plants, whose construction costs are already paid for, remain competitive. As Mark Diesendorf from UNSW wrote in a detailed plan for the Australia Institute in November, it is well established that renewable energy can provide all of our power needs. Computer simulation modelling shows that wind and solar projects distributed across a wide area can provide most of our needs, because when the sun isn’t shining and the wind isn’t blowing in one area, power can be used from somewhere it is. There is also “practical experience when 100 per cent renewable electricity is already being reached for short periods of time in Denmark, Germany and South Australia”, he notes. Prime Minister Scott Morrison and Energy Minister Angus Taylor claim we need “reliable” power that is “dispatchable” on demand, as an excuse to support coal. Yet batteries and other storage systems allow renewables to provide power that is “dispatchable” at any time of day. This does, however, increase their cost. Snow Hydro 2.0 would be one method of storing power from renewable energy, pumping water uphill for release to power hydro turbines. It is expected to cost at least $4 billion and will be 100 per cent owned by the federal government. Another example is the $90 million Tesla battery in South Australia, subsidised to the tune of $50 million by the state government. Reaching 100 per cent renewable energy would also require upgrades to the electricity transmission grid to connect new solar and wind projects. This would also include new transmission lines to allow power to be sent across the country to where it was needed. For instance AEMO points out in its Integrated System Plan, “SA is a net exporter of electricity and still has enormous untapped wind and solar resources.” Yet it is currently has only one inter-connector, into Victoria. Eight years ago think tank Beyond Zero Emissions launched a plan for 100 per cent renewable energy in a decade, showing the concept was technically possible. Much has changed since. Renewable technology has created at least 15,000 jobs, and costs have fallen dramatically. Plans to get to 100 per cent renewable energy have sprung up like wind farms. Even AEMO produced a report into 100 per cent renewables in 2013, with one scenario investigating a relatively rapid transition by 2030. There will be significant costs to replace ageing coal plants in any case, as after around 50 years they are too expensive to repair, so that 60 per cent of their generating capacity is due to go offline in the next 20 years. A study from the ANU last year estimated, after accounting for grid upgrades and storage, that a fully renewable energy grid could provide power for $93 per megawatt hour. Another study from Winlab, a renewable energy company, said it could be as low as $70. This is not far above current wholesale energy prices which have fluctuated between $50 and $100 a megawatt hour in NSW, Victoria and Queensland over the last three years. The costs of new energy infrastructure are currently met through our power bills. It is vital to ensure a rapid transition to 100 per cent renewables does not result in higher power prices. This would push up the cost of living for workers and the poor. We saw with the carbon tax introduced in 2012 how the threat of higher power prices undermines support for climate action. Labor has adopted the National Energy Guarantee developed by the Liberals under Malcolm Turnbull, which would force power companies to meet an emissions limit. It would essentially rely on the market to install the new power generation needed, backed up by $10 billion over five years in new loans and investments through the Clean Energy Finance Corporation and $5 billion in loans to upgrade Australia’s transmission systems. The obvious solution for a more rapid transition is for government to step in directly, just like it has with the NBN, and build renewable energy itself. This is not a new concept. All coal-fired power plants in Australia were originally built by government, because of the scale of investment required. A good starting point would be for government to build the proposed solar thermal tower project in Port Augusta. Its recent collapse because of a lack of finance is a disaster. Coal workers fought for it, and it was one of the few coal communities where it was going to be possible to point to a real transition to new climate jobs. Where the market fails the government must step in. If the federal government is spend money to subsidise renewable energy, it should take direct control of the investments, rather than hand control to private companies who will siphon off government money as profit. Taking power back into public hands would also allow the government to cap power prices and stop increases driven by privatisation. Labor has promised to “end the power privatisation mess” but has no policy to achieve it. Labor is not promising to end privatisation. The Greens have much more ambitious renewable energy plans than Labor, backing 100 per cent renewable energy by 2030 and calling for a national publicly owned energy retailer. But private retailers and suppliers would remain. Instead of re-nationalising, they say their plan is intended “to increase competition in the National Electricity Market”. In addition The Greens’ support for carbon pricing is an obstacle to winning wider support for more serious climate action. Sudden and unplanned shutdowns could devastate communities and lead to electricity blackouts. A timetable for closure, as proposed by the Greens, would allow serious planning for a just transition, and retraining for workers on full pay. But existing coal workers and communities must be given job guarantees at current pay rates. The ALP is promising the establishment of a Just Transition Authority, and to legislate for a “pooled redundancy” scheme. When a power station closes, other power stations in the region would have to offer voluntary redundancies to allow workers to transfer to jobs at plants that remain open. But this is still a far cry from the thousands of new jobs that are needed. And the Just Transition Authority will only be given $8.5 million. Despite the advances in renewable technology, existing coal plants could run for decades without government intervention. The transition we need requires a challenge to the profits of the big power companies, by forcing them to close still profitable power plants. And it means demanding the costs of installing renewable energy be paid by big business and the rich. We need to build a powerful movement to force the kind of government action. That movement must harness the power of organised workers. That requires demands for climate jobs and climate action that will improve workers lives now, as well as stave off future disaster. In the US, democratic socialist Alexandria Ocasio-Cortez’s call for a Green New Deal that focuses on renewable energy, jobs and infrastructure, and taxing the rich to pay for it, has been enormously popular. It has sparked protests at offices of politicians who refuse to support it. These are the kinds of demands on which a powerful climate movement could be built.